Would You Pay for Influencers? 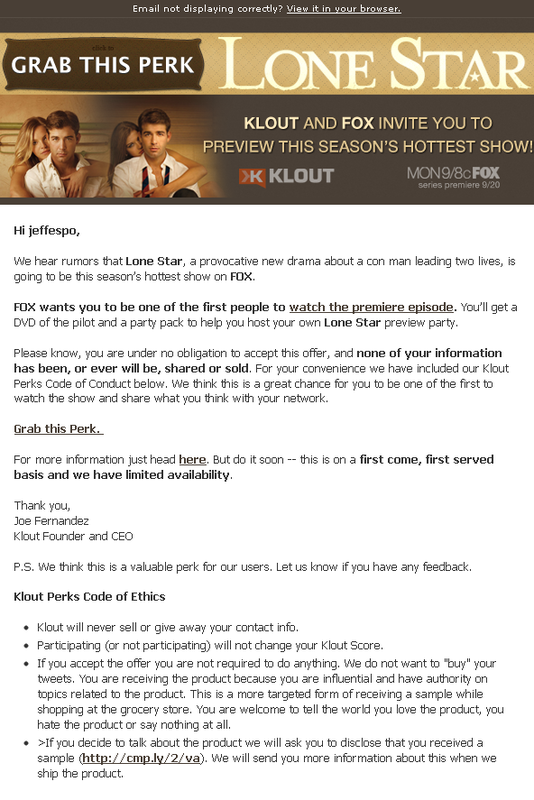 Last week I received an email from the folks at Klout informing me that Fox wanted to send me a watching kit for its new television series Lone Star. I am sure that some of you reading this got the same email. I’m not required to do anything for them but they mailed me a promotional package and I can talk about the show if I want to. Disclosure – I love free stuff, seriously. The popcorn tin and tailgate beer mugs were pretty sweet. Now don’t take this post as an endorsement – I watched the show and was not crazy about it. I am also not a television critic so my level of expertise on the matter is also questionable, which is what makes me wonder why I was selected as an influencer for this campaign. I am simply using this as a question of influence. Disclosure #2, I do not see myself as an expert or authority in anything; I am just a guy who loves his job, but if you want to send me free stuff go ahead. 😉 There I said it. To me, this seems like a slippery slope of sorts where advertising can invade in the PR territory a bit. Instead of researching and tailoring a list for your company or client, you can simply pay a list of folks with a large audience without knowing if they fit your brand. This new model sounds like the spray and pray model of PR or advertising. People in general like writing positively about stuff they get for free, but are the reviews uninfluenced? I would love to say yes, but I know better. People like free stuff and want to continue receiving free stuff so they will say nice things. I would rather get honest reviews, but love is always better than hatred. I worked with many mom bloggers as part of my job and still have 50 that I keep in regular contact with, but I never gave a dime to any of them. If money was going to be discussed, I brought in my marketing team – which should be the action of any responsible flack. Throwing mud at the wall is what gives us flacks a bad name and spending dollars and praying for success is why we have advertising. So I wonder if the Klout influencer advertising model is destined for mediocrity or if it will catch on. What do you think? Is this new kind of advertorial/praying for positive buzz good for the PR industry or does it set us back some? Previous PostMedia Disasters Prove that PR Professionals are NeededNext PostDo you know what people are saying about you?